Need raw data for more analysis? 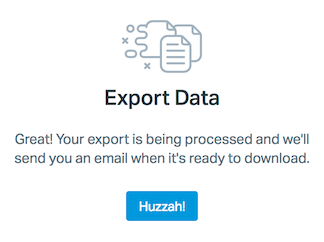 You can export your reporting data on-demand. Export options are available for the All Channels, Email, Company/User, and Happiness reports. Note: By default, only the Account Owner and Administrators can export reporting data. If Users also need access to exporting reports, the Account Owner or an Administrator can change the User permission sets. 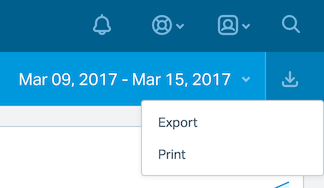 Head over to the Reports menu, then select the report you want to export. In our example below, we're exporting data from the All Channels report. Create or load a View, then click the Export/Print icon next to the date filter in the top right corner. Select the Export option from the menu. In the modal that appears, take a quick glance to make sure this is the date range and view you'd like to export. Select the desired format (CSV or XLSX only) and hit the blue Export button. And we're done! You'll get an email when the export is ready. Click the blue Huzzah! button to dismiss the modal. 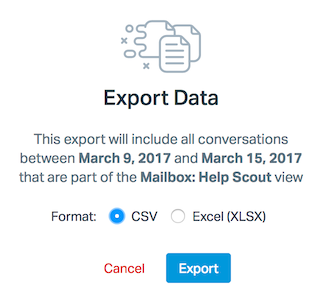 Keep an eye on your inbox (for the address you use to log in to Help Scout with) for the export email. 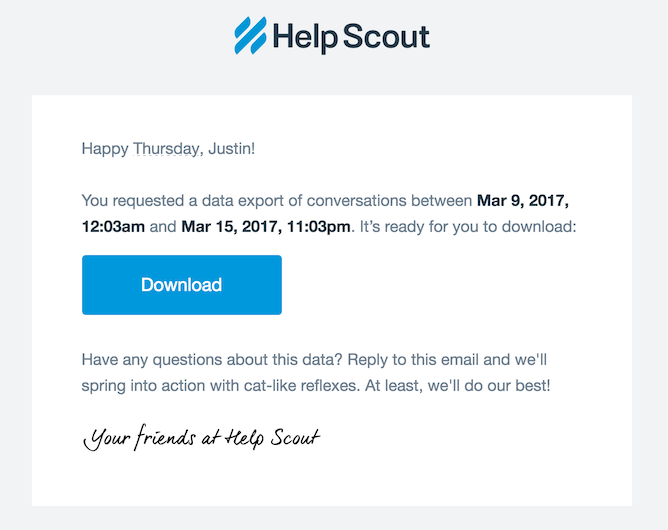 It'll come through with: Data export from Help Scout as the subject. Click on the blue Download button to download the CSV or XLSX file. Just about everything, with the exception of conversation thread contents, and satisfaction ratings comments. Note: If you're a Plus plan customer, Custom Field values for other mailboxes will be included in every report. The column will be entirely blank if the exported view or report does not include the mailbox where those fields exist.